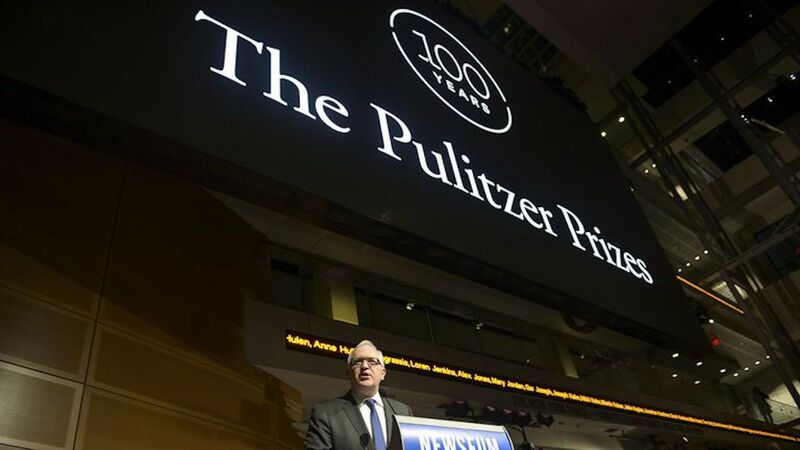 The 2019 Pulitzer Prize winners were announced Monday. The big winner: Local news outlets swept the major awards categories, winning the top prizes in public service, breaking news and investigative reporting. Winner: South Florida Sun Sentinel "for exposing failings by school and law enforcement officials before and after the deadly shooting rampage at Marjory Stoneman Douglas High School." Winner: Staff of the Pittsburgh Post-Gazette "for immersive, compassionate coverage of the massacre at Pittsburgh’s Tree of Life synagogue that captured the anguish and resilience of a community thrust into grief." Winner: Matt Hamilton, Harriet Ryan and Paul Pringle of the Los Angeles Times "for consequential reporting on a University of Southern California gynecologist accused of violating hundreds of young women for more than a quarter-century." Winner: David Barstow, Susanne Craig and Russ Buettner of The New York Times "for Times for an exhaustive 18-month investigation of President Donald Trump’s finances that debunked his claims of self-made wealth and revealed a business empire riddled with tax dodges. Winner: Staff of The Advocate, Baton Rouge, La. "for a damning portrayal of the state’s discriminatory conviction system, including a Jim Crow-era law, that enabled Louisiana courts to send defendants to jail without jury consensus on the accused’s guilt." Winner: Staff of The Wall Street Journal "for uncovering President Trump’s secret payoffs to two women during his campaign who claimed to have had affairs with him, and the web of supporters who facilitated the transactions, triggering criminal inquiries and calls for impeachment." Winner: Maggie Michael, Maad al-Zikry and Nariman El-Mofty of Associated Press "Press for a revelatory yearlong series detailing the atrocities of the war in Yemen, including theft of food aid, deployment of child soldiers and torture of prisoners." Winner: Staff of Reuters, with notable contributions from Wa Lone and Kyaw Soe Oo "for expertly exposing the military units and Buddhist villagers responsible for the systematic expulsion and murder of Rohingya Muslims from Myanmar, courageous coverage that landed its reporters in prison." Winner: Hannah Dreier of ProPublica "for a series of powerful, intimate narratives that followed Salvadoran immigrants on New York’s Long Island whose lives were shattered by a botched federal crackdown on the international criminal gang MS-13." Winner: Tony Messenger of the St. Louis Post-Dispatch "for bold columns that exposed the malfeasance and injustice of forcing poor rural Missourians charged with misdemeanor crimes to pay unaffordable fines or be sent to jail." Winner: Carlos Lozada of The Washington Post "for trenchant and searching reviews and essays that joined warm emotion and careful analysis in examining a broad range of books addressing government and the American experience." Winner: Brent Staples of The New York Times "for editorials written with extraordinary moral clarity that charted the racial fault lines in the United States at a polarizing moment in the nation’s history." Winner: Darrin Bell, freelancer "for beautiful and daring editorial cartoons that took on issues affecting disenfranchised communities, calling out lies, hypocrisy and fraud in the political turmoil surrounding the Trump administration." Winner: Photography Staff of Reuters "for a vivid and startling visual narrative of the urgency, desperation and sadness of migrants as they journeyed to the U.S. from Central and South America." Winner: Lorenzo Tugnoli of The Washington Post "for brilliant photo storytelling of the tragic famine in Yemen, shown through images in which beauty and composure are intertwined with devastation."